Dûl Incaru, the Eternal Return is a Hive Wizard and a daughter of Savathûn, the Witch-Queen. She is responsible for the Dreaming City's Taken curse, and is working alongside Quria to trap the city in a 3-week loop, so that her mother can access the Distributary and use it to empower herself to godly strength. She is often accompanied by her Darkblade bodyguards known as the Fatesmiths (Gaurog, Alak-Tor, and Ba-Kuur), whose presence shields her from harm and can even respawn moments after death. The eternal return hypothesis is a model of cosmological development which posits that the universe will re-enact the same series of events for eternity. 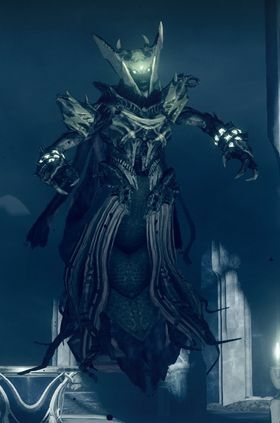 This is in reference to Riven's curse, specifically referring to any event of Dûl Incaru's death, the curse would 'reset' the Dreaming City to when the curse was first afflicted, progressing until Guardians once again kill Dûl Incaru again, and again, repeating the cycle every three weeks, creating a kill battery for Savathûn and giving her unlimited power. Dûl Incaru is the third child of Savathûn to appear in all of Destiny, after Balwûr and Malok, Pride of Oryx.